Last night my mobile balance was Rs. 123 and today morning it was Rs. -9. Not a single call made, Not a singe message being sent. mysteriously all balanced been snatched away. Check out vodafone's hidden charges. I have written an email to them. I will keep you posted when they reply me. I switched to vodafone from airtel since one year. Its been a pleasant experience so far. I like to use pre-paid services because they are cheap and i am comfortable with them. I have an high end smart phone. Motorola Milestone. My issue is with the vodafone VL 99 data plan. I have been using this data plan since last 5 months. 1) When the data plan is over. I do not recieve an SMS saying Your data plan is terminated you will have to recharge of 99 to continue using services. The money gets cut directly from my balance account. Because of this i lose around 100 to 150 rs. every month in 1 or 2 days. Since my data usage on phone are always very high. 2) I tried to activate VL 99 scheme earlier this month 3 times but every time it said You are not allowed to use this service. I tried to activate this scheme 4th and 5 th of june i am attaching the screen shot of my message. 3) I have lost my balance from Rs.123 to Rs.-9 in one night. THIS IS WRONG. 2) I try to refill at 1st of every month so that my ACT VL 99 plan remains active. This month however it just did not get active. I sent 3 sms this month. Give me a number where i get to know exactly which date my data plan ends. Give me a number where i can check my data plan usage. I need a message to be sent to my mobile when my data plan is been finished. I also expect you restore my balance as it is not fair to charge your customer for services he has no idea about. I would be expecting a reply soon. 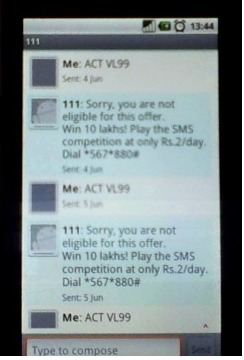 I posted a tweet on vodafone twitter http://twitter.com/#!/vodafonein but then still awaiting reply. If any other vodafone prepaid customers have any issue please comment below. He told me he is supposed to get back to me with a solution.Vodafone have established communication but issue still remains unsolved.